Twenty seven new �Active Schools Coordinators� were welcomed into their new active lifestyle promoting roles in Highland primary schools by the Chairman of The Highland Council�s Education Culture and Sport Committee and the Chief Executive of sportscotland. Highland Councillor Andrew Anderson and Stewart Harris, Chief Executive of sportscotland welcomed the new Active Schools Coordinators (Primary) today at Inverness Leisure along with Highland Council members and staff, NHS Highland health promotion and public health lead managers. 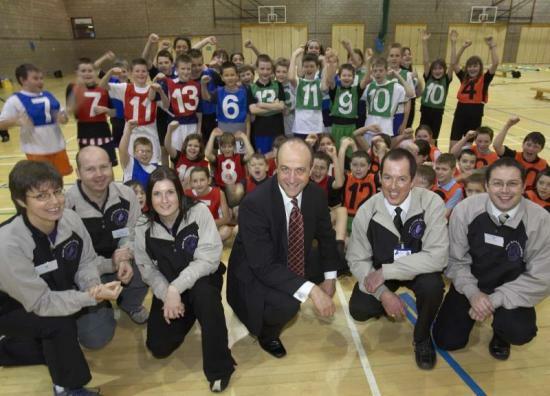 Active Schools is being rolled out in all 184 Highland primary schools. The Active Schools Coordinators will recruit volunteers and run a variety of programmes to suit each particular area. The programmes centre on active travel, active play, active curriculum and active clubs. The role of the Active Schools Coordinator is to provide safe and enjoyable physical activity and sporting opportunities for children and to address target 1 of the Sport 21 Strategy (the National Strategy for Sport in Scotland) by making 80% of children active for one hour a day every day of the week. In secondary schools the target is to increase sporting participation amongst mid teens, particularly girls. Councillor Andrew Anderson said: �With the confirmation of our twenty six new Active Schools Coordinators today, the future for Highland school children becoming �more active, more often� is significantly moving forward. �Already we are seeing an increase in the variety and number of activities taking palace in and around schools. Better communication of information and support is being given to children to enable them to become more active. Active School Coordinators will assist with making the links for children from the school curriculum P.E. programme to the opportunities available in out-of-hours time in communities and at clubs.